The global image sensors market was valued at USD 13.6 billion in 2017, and is expected to witness a CAGR of 10.3%, during the forecast period (2018 – 2024). Excessive adoption of image sensors technology among the automotive industry is the major factor driving the growth of global image sensor market. Image sensor is used for converting an optical image into an electronic one and it is extensively being used in imaging devices and digital cameras that helps in converting imaging devices into a digital image. On the basis of technology, the image sensors market is segmented into charge-coupled device, complementary metal-oxide-semiconductor and others. Among all these segments, complementary metal-oxide-semiconductor hold the largest share in the global market due to its features such as lower power consumption and decreased size of the system. On the basis of spectrum, the image sensors market is categorized into visible and non-visible spectrum. Non-visible segment is further sub segmented into x-ray light and infrared non-visible spectrum. The non-visible spectrum is expected to witness higher CAGR of 12.0% during the forecast period since the cameras that are capable of functioning in the invisible spectrum find increased applicability in security and surveillance. Additionally, this segment is observing rampant investments from the key players such as Panasonic Corporation to enhance their product portfolio. Based on array type, the image sensors market is categorized into area and linear image sensor. Among these two segments, linear array is expected to witness higher growth during the forecast period. On the basis of vertical, the image sensors market is categorized into automotive, commercial, healthcare and life sciences, consumer electronics, aerospace, defense and homeland security, and industrial. The automotive segment is further sub categorized into forward-looking ADAS, camera mirror system, rear- and side-view and in-cabin ADAS. Healthcare and lifesciences is further sub segmented into endoscopy, x-ray imaging and others. Additionally, consumer electronics is further sub segmented into desktops and laptops, commercial drone, photography and videography, wearables, smartphones and tablets, service robots, commercial copier and scanner and residential surveillance. Industrial segment is further classified into industrial surveillance and monitoring, machine vision and robotic vision. Among all these segments, consumer electronics account for the largest revenue in the global market due to increasing upgradation in the CMOS technique that has significantly impacted the dissemination of image sensors into smart devices. Moreover, extensive demand for dual and secondary camera in smartphones is further strengthening the growth of image sensors market across the globe. Constant progressions and innovations in the CMOS imaging technology, fabrication and design are the key trends observed in the image sensors market. Current improvements in the CMOS technology have considerably upgraded signal-to-noise ratio (SNR) intensities in machine visualization presentations at higher speed, and providing cost effectiveness, improved performance and functionality to the CCD technology. Increasing demand for dual camera in smartphone and tablets along with miniaturization are the major factors driving the growth of the image sensors market. It has been observed that CMOS based technology is extensively being utilized in dual-camera smart phones that leads to increasing popularity of these phones among various gen-next photographers. Moreover, excessive demand for improved medical imaging systems is other factor pertaining towards the growth of the image sensors market. These factors are thereby bolstering the growth of the image sensors market across the globe at a rapid pace. Globally industry players are leveraging market growth through new product development, mergers & acquisitions, partnerships, increased investments and technological upgradation that is supporting the image sensors market growth across the globe. Geographically, Asia-Pacific hold the largest share in the image sensor market, globally. The growth of image sensors market in this region is due to increasing industrialization and research and development activities. Additionally, increasing requirement of safety related directives in the automotive domain is increasing due to large number of accidents cases. 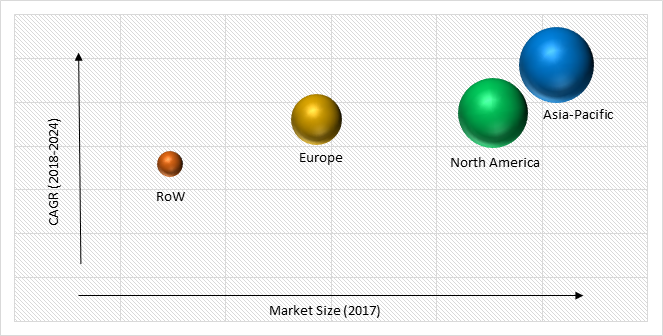 Extensive accident cases are thereby instilling the requirement for ADAS (advanced driver assistance system) in the automobile domain with the assimilation of progressive image sensing proficiencies acting as a major market driver, and further accentuating the growth of image sensors market in this region. 10.2. Samsung Electronics Co. Ltd.
Table 257 Snapshot – Samsung Electronics Co. Ltd.
Table 258 Snapshot – OmniVision Technologies Inc.
Table 259 Snapshot – Canon Inc.
Table 261 Snapshot – SK hynix Inc.
Table 262 Snapshot – STMicroelectronics N.V.
Table 264 Snapshot – Hamamatsu Photonics K.K.